According to his birth certificate, Henry Joseph Spink was born on 6th July, 1838 at 15 Lisson Grove North, in the Marylebone district of London, Middlesex. However, in census returns, Henry J. Spink , for some unknown reason, indicates that he was born in Marylebone, London around 1842. Henry Joseph Spink was the son of Charlotte and Henry Spink, an ironmonger by trade. By 1860, Henry was in Birmingham working as a watchmaker and jeweller. It was in this city that Henry married Sarah Cooper ( born c 1841, Berkeley, Gloucestershire ) the daughter of Charles Cooper, a boat builder. [ COURTESY OF DENISE DAGEN OF NEW SOUTH WALES] . Portrait of a man with arms folded by Henry Spink of 109 Western Road, Brighton (c1870). RIGHT ) An advertisement for Henry Spinks' two studios, from the Cliftonville & Hove Mercury, dated Friday 2nd May 1879. 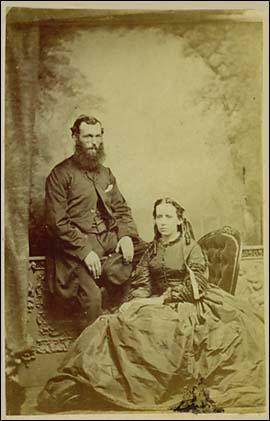 Henry Spink and his wife were living in Brighton from about 1864. 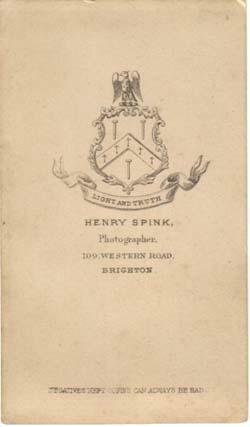 Their first son, Henry Charles Spink, was born in Brighton on 27th February 1865 and an advertisement published by Henry Spink in September 1878, claimed his photographic studio had been established 15 years, which suggests he arrived in Brighton before 1864. Henry Spink is first recorded as a Photographic Artist in the Trades and Professions section of Page's Brighton Directory of 1865, which would have been compiled in the latter half of 1864. 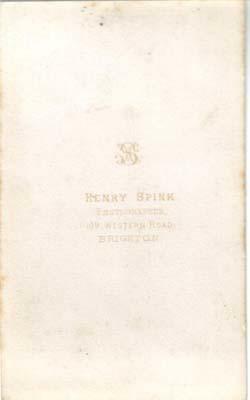 In Page's Directory of 1865, Henry Spink is lIsted as a photographer at 109 Western Road, Brighton. Previously, 109 Western Road was occupied by Robert W. Salter, an artist who later exhibited as a photographer in London. ( By 1864, Salter was living at 9 Norfolk Road, Brighton, making a living producing "Photographic Portraits", which he painted in oil or water colour.) In the Brighton Examiner , dated 20th September 1864, there is an advertisement for The West End Photographic Company of 109 Western Road, Brighton. The West End Photographic Company was a long established firm in London and appears to have established a branch studio in Brighton before 1864. The West End Photographic Company charged only 5 shillings for a dozen carte de visite portraits ( High class Brighton studios, such as Mayall's Photographic Portrait Studio or Hennah & Kent in the Kings Road, charged a guinea or £1.1s for a dozen cartes de visite). 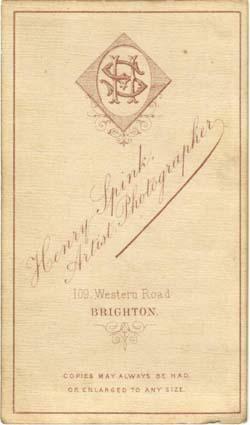 Henry Spink may have been the manager of the Brighton branch of the West End Photographic Company in 1864, but before the end of the year, he had taken over the studio and the business was operating under his name. 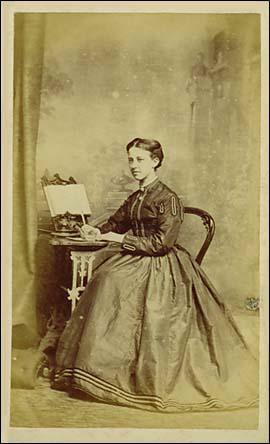 Photographs produced by Henry Spink in the 1870s carry his name, but carry the banner "The West End Brighton Studio, 109 Western Road." Around 1867, Henry Spink opened a second studio at 70 Kings Road, Brighton, but this studio lasted less than a year. 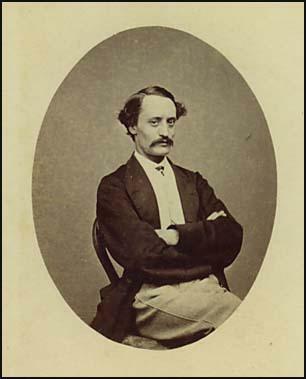 ( The studio at 70 Kings Road had been established by the Dickinson Brothers around 1862 and in 1865 was run by the photographer George Cassinello ). 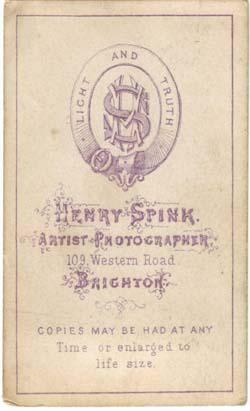 By the end of 1867 Henry Spink was operating solely from his studio at 109, Western Road, Brighton. ARTIST PHOTOGRAPHER AND MINIATURE PAINTER. EQUESTRIAN AND THEATRICAL PORTRAITS TAKEN IN THE MOST ARTISTIC STYLES. MANSIONS, LANDSCAPES, ANIMALS, TOMBS, STATUARY, etc PHOTOGRAPHED. OIL PAINTINGS CLEANED OR COPIED. PHOTOGRAPHS COPIED OR ENLARGED TO ANY SIZE AND PAINTED IN OIL OR WATER COLOURS.PORTRAITS OF DECEASED PERSONS FAITHFULLY COPIED AND RESTORED. PARTIES ATTENDED AT THEIR OWN RESIDENCES. By the time of the 1871 Census, Henry Spink was living at 19, Borough Street, Brighton . ( Borough Street and the previous address in Crown Street both led into Western Road, where Spink's studio was located ). Henry Spink gives his age as 29 and describes himself as a "Photographer & Stationer". Living with him at his house in Borough Street is Sarah, his 30 year old wife, his two sons, Henry aged six and Samuel aged three and a 14 year old domestic servant. 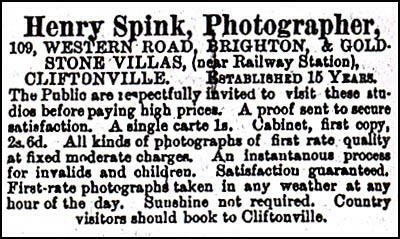 In September 1878, Henry J. Spink was advertising a second studio at Goldstone Villas, Cliftonville. An advertisement on the back of a Henry Spink carte de visite portrait dating from around 1870. 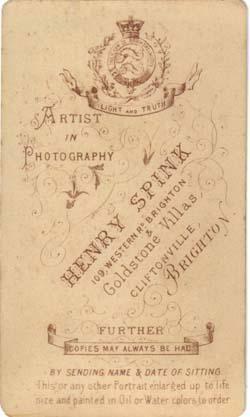 Notice that Henry Spink called his photographic business in Western Road, "The West End Brighton Studio"
In September 1878, Henry J. Spink was advertising a second studio at Goldstone Villas in the district west of Brighton, then known as Cliftonville, but now part of Hove. Before 1851, Hove was a small village separated from Brighton in the east by a mile of open country. To the east and north east of Hove was an estate called Cliftonville, which was developed in the 1850s by a syndicate of four businessmen . Charles Fleet writing in A Handbook of Brighton and its Environs in 1858, commented that : "Cliftonville sprang into existence with the rapidity of a Trans-atlantic town. House after house, and villa after villa seemed to rise by magic." The Ilustrated Times of February 1859 reported that " there is now no Hove at all ! - nothing as low or common ! Cliftonville , sir, if you please, the new suburb of Brighton ! filled with new little houses, very pretty and clean to look at, and awfully genteel little houses". By 1865, Cliftonville had its own railway station and in the late 1870s a number of new buildings were constructed along what was then called Station Road, but was soon to be renamed Goldstone Villas. Henry Spink's house and studio appears to have been one of the first buildings to be erected in Goldstone Villas. The entrance of Cliftonville Railway Station( later renamed West Brighton Station, but now known as Hove Station ) ran directly on to Goldstone Villas and Henry Spink was keen to advertise the fact that his studio was "near the Railway Station" and he advised "Country visitors" to book direct to Cliftonville. In 1879, a branch railway line called the Cliftonville Spur was completed, allowing trains from London to travel direct to Cliftonville and Hove, avoiding the Brighton Terminus. Henry Spink believed his prices were very reasonable and in his advertisements he stated that " the Public are respectfully invited to visit these studios before paying high prices." In 1878, Henry Spink charged 1s for a single carte - the same price the West End Photographic Company was charging in 1864. Cabinet portraits were priced at 2s 6d for the first copy. 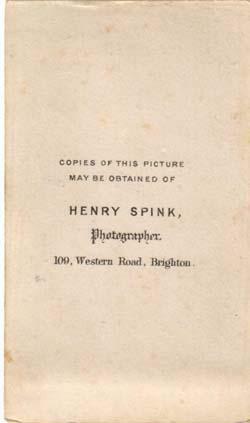 Henry Spink advertised "all kinds of photographs of first rate quality at fixed moderate charges". He also offered "an instantaneous process for invalids and children" ( Highly sensitive gelatin plates had been introduced in the late 1870s reducing exposure times to a fraction of a second ). 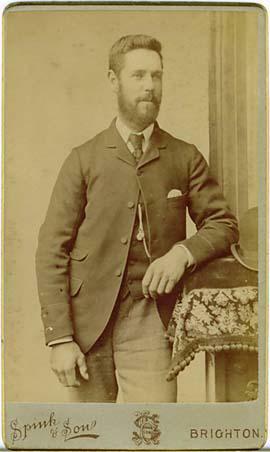 Henry Spink operated his two photographic studios, the Brighton branch at 109 Western Road and the Cliftonville branch at 36 Goldstone Villas, almost up until his death in 1892. [ABOVE] A photograph of Henry Joseph Spink's house and studio in Goldstone Villas, Cliftonville, taken around 1878. Henry Spink's two sons pose by the entrance and his wife stands at the gate. [COURTESY OF DENISE DAGEN OF NEW SOUTH WALES] . At the time of the 1881 Census, the Spink family were residing at 34 Goldstone Villas, Cliftonville, now classified as within the district of Hove. Henry Spink senior gives his age as 39 and describes himself simply as "Photographer". 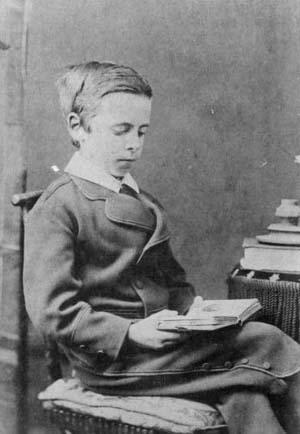 Sixteen year old Henry Spink junior was living at home, but his brother Samuel was a 13 year old scholar,boarding at The Classical Grammar School, Henfield Road, Cowfold, about 11.5 miles north of Hove. By 1884, probably the result of the addition of new houses in his road, Henry Spink's house and studio in Goldstone Villas was re-numbered as No 36. 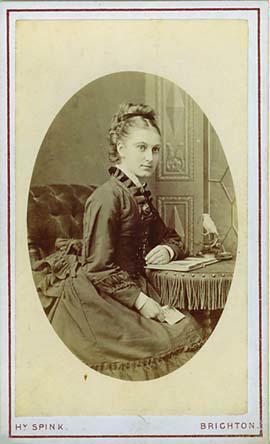 Henry Charles Spink probably assisted his father in his photographic work throughout his teens and for a time the firm was known as Henry Spink & Son, but around 1887 Henry Spink junior set himself up as an independent photographer in Brighton. Page's Trade Directory of 1888 lists Henry Spink junior under Photographic Artists and gives the 23 year old photographer's address as 48 Preston Road. However, by 1890, Henry Spink junior was operating his father's old studio at 109, Western Road. Kelly's Sussex Directory of 1890 lists Henry at Western Road and his father, H. J. Spink at 36 Goldstone Villas, Hove. At the time of the 1891 Census, twenty-five year old Henry Spink junior was boarding at an inn called "The Swan" at 40, Borough Street , Brighton. He gives his occupation as " Photographer" (Employer) ". His father. Henry J Spink is now residing at his studio at 36 Goldstone Villas with his wife Sarah. 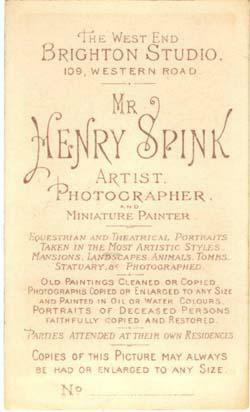 Henry Spink senior gives his profession as " Photographic Artist " and both he and his wife give their age as 52. Their youngest son, Samuel George Spink had emigrated to Australia before 1890 and he was living in Mitchum,South Australia when the 1891 Census was taken in England on 5th April 1891. [ ABOVE and RIGHT ] Two portraits taken at the Western Road studio of Henry Spink junior around 1890. 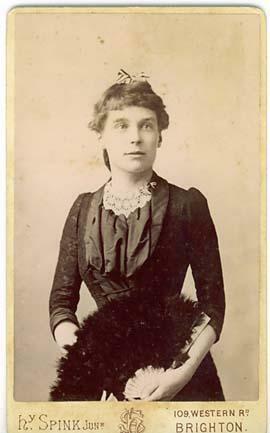 [ABOVE] A carte de visite portrait taken around 1887 when the firm of Henry Spink & Son was running a studio at 109 Western Road, Brighton and another at 36 Goldstone Villas. On 23rd May 1892, Henry Joseph Spink died in Hove at the age of 53. He must have been a well known figure in the area, as Henry Porter's The History of Hove, published in 1897 mentions "that clever photographer Henry Joseph Spink" amongst other notables buried in St Andrew's churchyard. In Page's 1893 Directory of Brighton, Henry Spink is listed as the proprietor of the studios at Western Road and Goldstone Villas, yet the 1894 edition lists S. G. Spink at both these studios. Samuel George Spink must have returned briefly to England around 1893 with his Australian wife Elsie Hastwell and his baby son, Sydney. Early in 1894 Samuel Spink sailed back to Australia with his wife and son. Samuel Spink returned to Adelaide where he established a photographic studio. Samuel Spink was also active as a photographer in Melbourne and Sydney in the early 1900s. Page's 1895 Directory lists Henry Spink junior at 109 Western Road and his widowed mother Mrs Sarah Spink at 36 Goldstone Villas. In 1893, Henry Spink junior had married Isabella Hannah Honner ( born c1868 Brighton ), daughter of Charles Walter Honner, a draper, and Lucy Honner nee Davey ( born c1834 Lewes ). [ In 1881, widowed Mrs Honner was living with her two teenage daughters at 17 Norfolk Road, Brighton ].A son named Sydney was born to Henry and Isabella Spink in Brighton around 1895. From 1895, Henry Spink junior ran the studio at 109 Western Road, Brighton, while his mother Mrs Sarah Spink managed the studio at "Goldstone Villa", 36 Goldstone Villas, Hove. 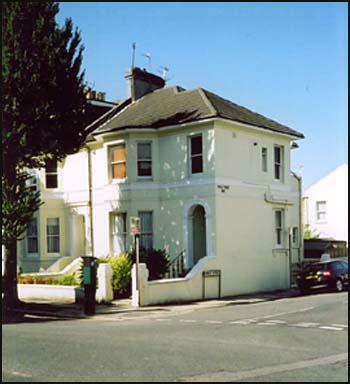 By 1897, the studio at 36 Goldstone Villas was in the hands of Frank H Berry ( born c1852, Brighton). Midway through 1899, Mrs Sarah Spink died in Hove at the age of sixty. It seems that Henry Spink junior sold the Goldstone Villa studio to the photographer John Weaver Innes ( born c1863 Hackney London ) who formed a partnership with Henry Bate ( born c 1863 London ) previously a manufacturer of guns and bicycles. The partnership of Innes & Bate was short lived. John Weaver Innes set up another studio in Hove, but Henry Bate was still taking photographs at the Goldstone Villa studio in 1913. 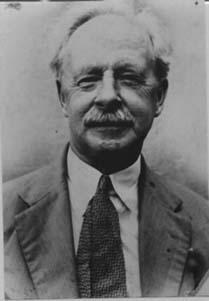 Henry Spink junior moved back to live in Hove around 1896, the year that his eldest daughter was born. At the time of the 1901 Census, Henry Charles Spink was living at 7 Addison Road, Hove. Henry Charles Spink gives his age as 36 and his occupation as 'Photographer, Employer' . Also living at their home in Addison Road was Henry's 33 year old wife Isabella and their three children - Sydney, aged 6, Edith Dorothy,aged 4, and Marie, aged 1 ( both daughters had been born in Hove ). Henry Spink junior was reasonably well off, employing two servants - a 15 year old house maid Mabel Clements from London and 20 year old Gertrude Pearce, who had been born in Gloucester and was now employed as a domestic servant. The Studio of Henry Spink junior continued at 109 Western Road, Brighton until 1935. Around 1935 the studio of Spink (Brighton) Ltd at 109 Western Road amalgamated with the photographic firm of Jaye & King. Henry Charles Spink died in Ditchling on 13th August 1943, at the age of 78. Henry's younger brother, Samuel continued as a photographer in Australia, eventually retiring to Gilgandra in New South Wales, where he died on 20th December 1948, aged eighty. Sometime before 1891, Samuel Spink emigrated to Australia. A family story suggests Samuel travelled to Australia as a steerage passenger andarrived with little money, but equipped with a camera and photographic apparatus. For a couple of years, Samuel Spink worked as an itinerant photographer in the region around Adelaide. While travelling in the area, he met Elsie Day Hastwell, the daughter of the Reverend Edward John Hastwell and Elizabeth Day. Samuel Spink married Elsie Hastwell (1868-1953 ) on 4th March 1891 and soon established a permanent studio at Gawler Place, Adelaide. 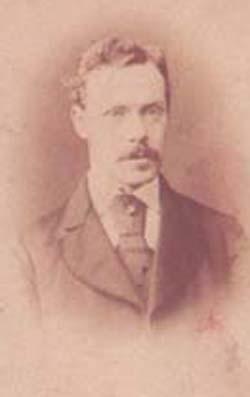 On the death of his father in 1892, Samuel Spink returned to Brighton and for a brief period he operated the Spink studios in Western Road and Goldstone Villas. Samuel Spink remained in Brighton for less than a year before sailing back to Australia. Samuel and Elsie Spink and their infant son Sydney Noel arrived back in Adelaide on 20th March 1894. 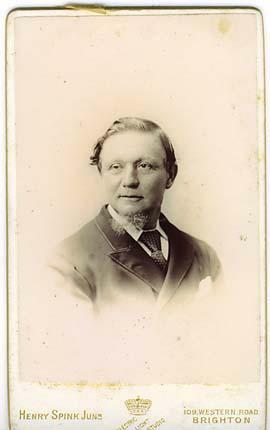 Samuel Spink ran his studio in Gawler Place, Adelaide until 1899. Over the next few years, Samuel Spink established studios in Melbourne, Victoria, and Sydney, New South Wales, but from 1903 to 1908 he was working in the Adelaide district again. Around 1920, Samuel Spink and his wife moved to Gilgandra, New South Wales to be near their eldest daughter Elsie Marjorie (1895 -. 1984 ).For the remaining years of his life, Samuel worked as a photographer from his house in Gilgandra. Samuel Spink died in Gilgandra on 20th December 1948 at the age of 80. 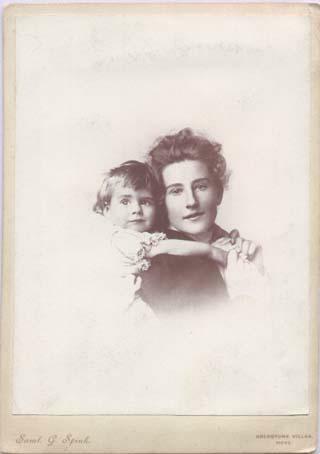 [ ABOVE ] A portrait of Samuel George Spink's wife Elsie and their first son Sydney Noel taken in 1893 when Samuel G Spink was running his late father's studio in Goldstone Villas in Hove. Early in 1894, Samuel Spink and his family returned to Australia. [ABOVE ] A portrait of Samuel George Spink, who made a career as a photographer in Australia, running studios in Adelaide, Melbourne and Sydney. [ABOVE] A selection of carte de visite backs from the studio of Henry Spink produced between the years 1865 to 1885. Thanks to Denise Dagen of New South Wales, Australia, who is descended from Henry Joseph Spink and provided family photographs and information on the Spink Family History.